(CelebrityAccess) — Singer Songwriter Jackson Browne announced plans for an acoustic tour of North America set to begin early next year. The run kicks off with a show at William G. Bell Auditorium in Augusta, Georgia on January 6th and wraps after a show at the Van Wezel Performing Arts Hall in Sarasota, Florida on Jan. 24th. 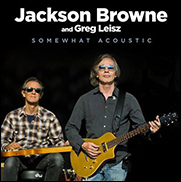 Accompanying Jackson Browne on tour is renowned multi-instrumentalist Greg Leisz. Browne is slated to perform a series of dates in Japan in October, including two nights at Tokyo’s Orchard Hall with other concerts slated for Nagoya, Osaka and Hiroshima.